Almost every thing but I was wondering why I have to pay for room cleaning service like 17.5 to 25 € ? Only one time per staying !?!?! Location is great, 20m from a big metro station where 7 lines intersect. It’s in a great neighboorhood and car free so less traffic noise. It’s super central, lots of great restaurants and perfect shopping with Forum Les Halles around the corner. Free coffee and thee in the lobby was also a great gesture. Great location, provided you book a room with a view on a high floor. Every morning no hot water when you needed to a shower to srart your day! Always one elevator was not working.I spoke to the staff about the hot water and they said someone will check it out because it never This before,come on!Heavy stains on the sheets!Terrible! Clean, convenient location, nice view, quiet room, stocked kitchenette. Very central location, close to key metro/RER station with direct access to airport/ Disneyland and the station is equipped by elevators. Many cafeterias , bars and restaurants around, Louvre, Siena are 10minutes walk. Rooms are big and comfy, kitchenette helped to manage late breakfasts. Staff is very customer oriented. We were placed into a room close to hotel’s lifts, and the noice was disturbing. The room was changed quickly. The hall and coffee area are pleasant for short break throughout a day. Very good value for money. Loved the location and the kitchen and laundry was a plus for us. Staff was nice, helpful. Lock in a great price for Citadines Les Halles Paris – rated 8 by recent guests! One of our top picks in Paris.Citadines Les Halles Paris is in Paris next to the Forum des Halles and just over a quarter mile from the Pompidou Centre. It has air-conditioned apartments and a 24-hour front desk that has tea and coffee upon arrival. The apartments at Citadines Les Halles Paris come with a telephone and flat-screen TV. Each apartment has a private bathroom with bathtub and an equipped kitchen with a microwave, dishwasher and fridge. A buffet breakfast is served daily at Citadines Les Halles Paris. 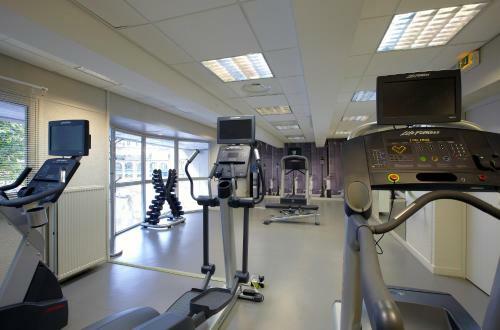 There is a 24-hour fitness center, 3 meeting rooms and a business center with free Wi-Fi access. Additional facilities available upon request include laundry services and a booking service for events and tours. Babysitting services can also be organized for extra charges. Chatelet-les-Halles Metro Station is 650 feet from the apartment-style hotel, providing direct access to Roissy Charles de Gaulle and Orly Airports. The Louvre Museum is a 10-minute walk away. Notre Dame Cathedral is just under 1 miles from the property. 뀐 Located in the real heart of Paris, this property has an excellent location score of 9.3! When would you like to stay at Citadines Les Halles Paris? - safety deposit box and hairdryer. This apartment features a private pool. This studio has a dishwasher, electric kettle and stovetop. This apartment features a electric kettle, stovetop and seating area. This studio has air conditioning, electric kettle and toaster. Our property is situated in a district once known as “the belly of Paris” next to the Forum des Halles and just over a quarter mile from the Pompidou Centre. You can enjoy shopping at Rue de rivoli or visit la Seine, Pont Neuf, the Louvre. At Citadines les Halles you will find an international team of over 40 high-performing people. From wherever you come, we will make feel yourself at home. Area Info – This neighborhood is a great choice for travelers interested in food, shopping and museums – Check location Excellent location – show map Guests loved walking around the neighborhood! House Rules Citadines Les Halles Paris takes special requests – add in the next step! Citadines Les Halles Paris accepts these cards and reserves the right to temporarily hold an amount prior to arrival. Please note that heating is active from 15 October to 14 April and air conditioning is active from 15 May to 14 October. Didn’t like the water pressure in the shower & the rooms were quite small!! Our room was not ready until after 8pm, and there was absolutely no apology from the reception staff; the rooms were much smaller than described online and very average accommodation- not what we had anticipated at all. Nothing major. Maybe you can do something about the fried waffles smell that fills the corridor from time to time. Sat night was a little noisy, facing the square. Nice view though. Great location, easy to get to and from, and around. Not much of an "apartment". Was much smaller than expected. No a/c in March - but that was solved by opening a window. Seemed overpriced @ 260 euros per night...but probably paying for location more than anything else. Perfect location for a first time visit. Several of the major attractions are within walking distance. Lots of cafes, restaurants and shopping close by. Less than 1 minute walk from the Chatelet Les Halles Metro station. Great selection of teas in the lobby area. Kitchenette was well stocked. For a short stay, this is perfect. The studio is bigger as most hotel rooms, definitely in this price range. Situated in the centre with many bars and restaurants in the direct area, the rooms are quiet enough, you do not hear so much noise from outside. Very recommendable for a few days Paris!